Of all the concerns I had about moving to a new country, being gluten free was actually pretty low on the list. I was more worried about finding my brands of cosmetics than what I’d eat. I was fortunate to be moving to another English-speaking country, as I think being gluten free in a foreign language would be a completely different experience. This is what I’ve learned being a gluten free ex-pat in the United Kingdom. As I covered in my recent article on ingredient information, the UK identifies all gluten-containing grains as allergens (not just wheat like the US.) This means figuring out if a grocery item is gluten free is really easy. Generally, UK labels will include allergens in bold print in ingredients lists, making it really obvious to the customer. I didn’t really know the grocery store chains here when I moved (I’d heard of Tesco and Marks and Spencer.) I was pleased to discover that most grocery store chains have their own “Free From” line of products which cater to gluten free, dairy free and other common allergen free customers. Most chain grocery stores have a small section for these Free From items (or sections, if they carry frozen items as well.) Some of these products aren’t good, but Tesco makes a really good Kit-Kat copycat, and Marks and Spencer does awesome gluten free tempura chicken strips. These are both delicious finds in the United Kingdom. Genius is a brand of gluten free breads, cakes and pastries which operates out of nearby Edinburgh. They make really good sliced bread, and it’s in all the chain grocery stores, usually even the smaller shops. It’s sold on shelves – NOT in the freezer section, as is so common in the United States! It toasts nicely and makes a great sandwich – basically, it tastes and behaves like real bread. I went a little bread crazy when I first discovered it. When I moved, I had been concerned about finding my brand of makeup and shampoo. I hadn’t even considered that food brands would be totally different. This was really tricky at first, because everything I knew I could eat was suddenly unavailable. I spent a lot of time reading labels at first. Exceptions: Heinz is really big here, and Udi’s is quite common as well. Unfortunately, something in Udi’s products makes me sick, so I can’t eat those in either country. 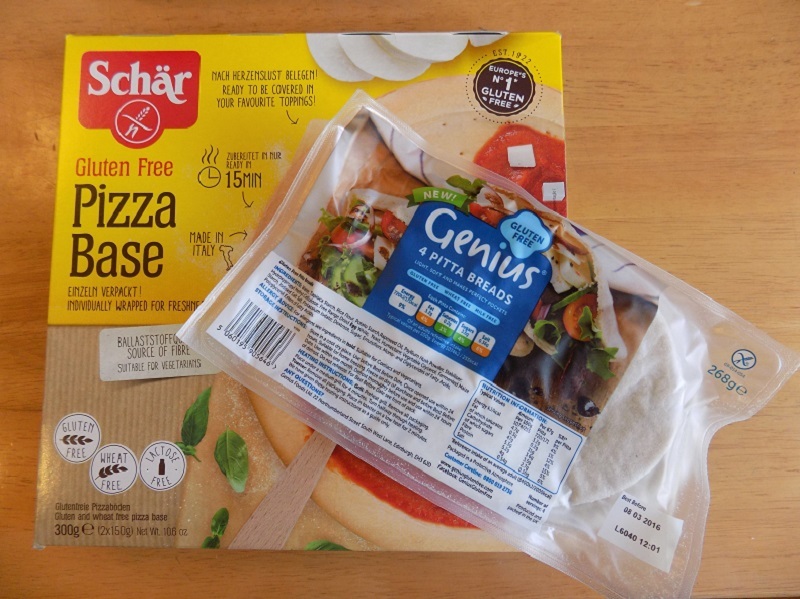 Now that I’ve been here for a while, I’ve discovered gluten free brands like Mrs. Crimbles, which does some really good crackers, and Dr. Schär, which does a lot of good snack foods like cookies and pretzels, nice breads and rolls, and good frozen pizza as well. You know how in the US, it seems like there’s high fructose corn syrup in everything? That’s how I feel here with barley (or barley malt.) Things I never expected to find it in include about half the chocolate bars, several flavors of potato chips and in soups. I remember reading about crumpets in a book, but I never knew what a crumpet was. 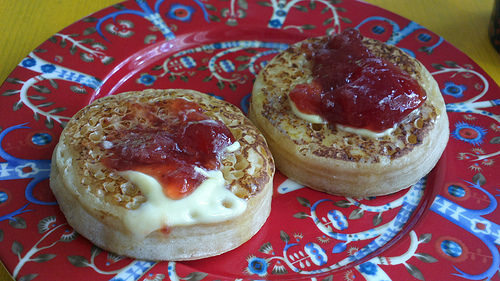 I’ve avoided picking up gluten free crumpets because frankly, I still don’t know what they are. Other strange foods I’ve encountered: Jaffa cakes, tea cakes, and flapjacks (not like a US flapjack). They call cookies “biscuits” and don’t really have the thing we know in the US as biscuits. Potato chips are crisps, and French fries are chips. Haggis is served with neeps and tatties and there’s another dish called bangers and mash. I’ve had to learn a new language of food here. Britons sure seem to love sugar. From the sweet baked beans they eat at breakfast (sorry, can’t get used to this) to the condiments they sell, everything seems to have extra sugar compared to the US. Notably different sauces include mayonnaise, spaghetti sauce and salsa. This has taken some getting used to. Had I known ranch dressing didn’t exist in the UK, I would have brought seasoning packets with me. (This has been corrected now, thanks.) Other US items that you just don’t see here include dill pickles and graham crackers. How can you live without S’mores, UK? 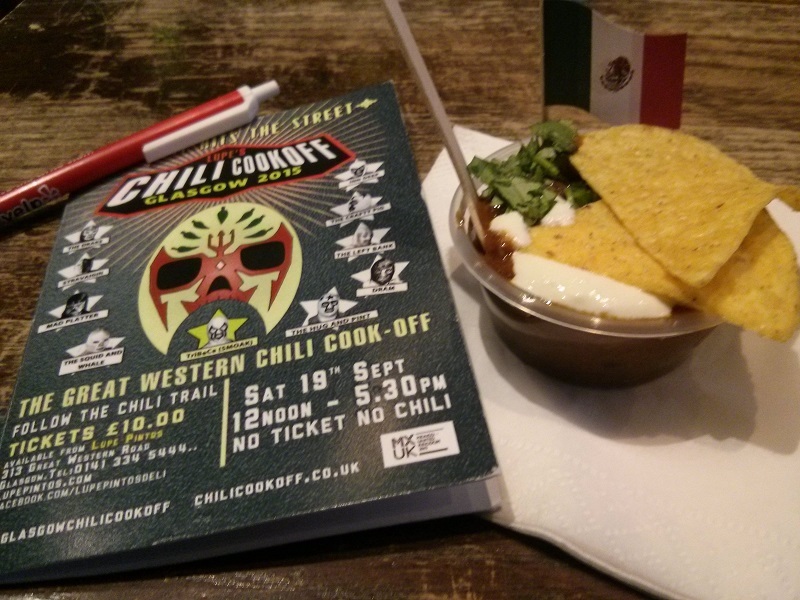 My favorite local deli, Lupe Pinto’s, hosts an annual chili cook-off. We live in the city proper, which means that within two blocks of our apartment, there are two small chain markets and about six ethnic delis or markets. However, if we want to go to a larger, more typically American-sized grocery store, we have to either take the subway a few stops over or take a bus (which makes doing a big, American-style mega shop impossible, because you have to carry everything home!) The small markets are convenient for eggs and milk but if you need a specialty item, forget it. Remarkably, there is a Costco in Glasgow. Stepping inside feels like being transported home, so similar is the look and feel of the Scottish version of the store. We have to either take a bus or recruit a friend with a car to reach it. It offers the same gigantic packages of produce, meats, cheeses and dry goods that the US stores do. The added bonus for me is that they often carry US brands, so I can find one kind of dill pickle here (in a massive jar) and gluten free Milton’s crackers, which are super good. Of course, we still have the same issue about getting our shopping home, so we can’t go too crazy in here! And there you have the good, bad and just different about shopping for groceries in a foreign land. All in all, it’s been quite easy being a gluten free ex-pat, with the possible exception of the first few weeks when I didn’t recognize anything familiar. Have you lived (or grocery shopped) abroad? What surprised you most about the differences? I’m so fortunate that I don’t have to be gluten free or that I don’t have any other dietary restrictions. I speak Japanese, but reading Japanese is a challenge even for native speakers. I’m know for sure that being gluten free in Japan would be a major challenge. Yep, I imagine gluten free in Japan (or China, or lots of places actually) would be really tough unless you had a pretty solid grasp on both the spoken and written language. In other European countries (and Brazil too) “gluten” is still “gluten” so I just have to learn “free” or “doesn’t contain” to get by! Sometimes I can have soba! Haven’t found a suitable gluten-free ramen substitute yet though. I have a friend who spent a while in Japan and she was always posting pictures of these amazing ramen dishes she ate. My only hope now is to learn to create them!